The Open Policy Making Toolkit was first posted in 2015 to help civil servants incorporate open policy practices into their work. Today, whilst it’s arguably not yet the ‘default,’ open policy making is certainly more widely practised and better understood. So is the open policy making toolkit still fit for purpose? How can we capture the experience of those already using it to learn which tools work and where policy teams might welcome more support? This blog was written by James Johnson and Lucy Jessop from DWP, working closely with the Policy Lab team. It follows our challenge, last week: How can we make it easier for policy makers to practise open policy? Every Policy Lab project starts with the user, and this was no exception. In this case our user was easy to reach: between Lab and the DWP Policy Exploration team, we had a range of contacts across departments who were a great starting point for conversations. We spent two months interviewing 48 policy officials from seven government departments. Our interviews were in three parts: starting with the day-to-day role of policy makers; then testing their attitudes towards open policy making; and finally focusing specifically on the toolkit. Policy makers collaborate all the time inside and outside government. They work with analysts, finance teams and lawyers to deliver ministerial priorities. They have long-standing relationships with charities, industry groups and other representative bodies. And much of their work is in partnership with other departments and public bodies. They recognise that their network of contacts could be even broader, bringing in the people affected by their policies, those on the frontline responsible for delivery, and digital colleagues in particular. Our research showed that the barriers to this are often quite practical: it can be hard to know where to start in finding and engaging with service users or frontline workers. They might also be cultural: we know ourselves that the worlds of policy and digital can feel quite far apart, with teams speaking very different languages. Policy makers are in regular contact with ministers, who make policy decisions, drive the pace of policy making and dictate timescales. Policy makers are often under pressure to produce outputs and demonstrate progress, and sometimes perceive this to be before they are ready to so. They are not always in a position to determine their own priorities, with urgent tasks – like answering Parliamentary Questions and meeting last-minute briefing requests – frequently taking precedence. Policy makers recognise the value of involving users when developing policy. 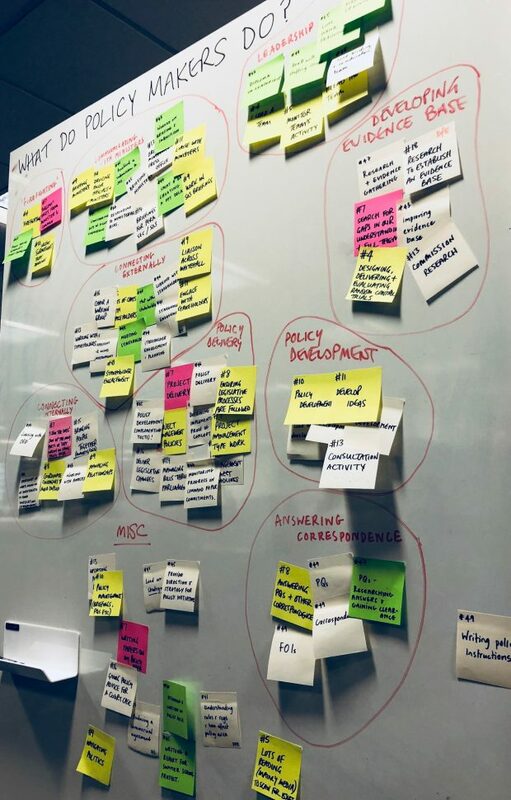 They typically see themselves as user-centred because they regularly engage external stakeholders and seek user views through the formal consultation process. However, we heard that they were more cautious about engaging users directly. This could be for various reasons, including perceived reputational risks, policy sensitivities, and concerns over representativeness. In particular, policy makers feared raising users’ expectations that significant change might happen as a result of their engagement. They typically preferred to go through civil society and representative groups. We asked policy makers what success looked like. Many of them said it could be measured by the quality of the evidence base (which is basically the information they use to make policy decisions). Policy makers work with economists, statisticians and social researchers to get as much information as they can to inform advice they give to ministers. Certain types of evidence were typically seen as of higher value than others - quantitative data in particular. Policy makers don’t always see how some open policy making practices fit with the day-to-day demands of the job. They thought it would be incredibly difficult without support and buy-in from senior leaders and ministers, and where the value was not immediately clear. Open policy making can sometimes be seen as a luxury, rather than a necessity. But even were this to change, some policy makers told us that they would only feel confident using the tools and techniques associated with open policy making if they had support and guidance. This is not easy for us to admit, but hardly anyone we asked had heard of the Open Policy Making Toolkit. 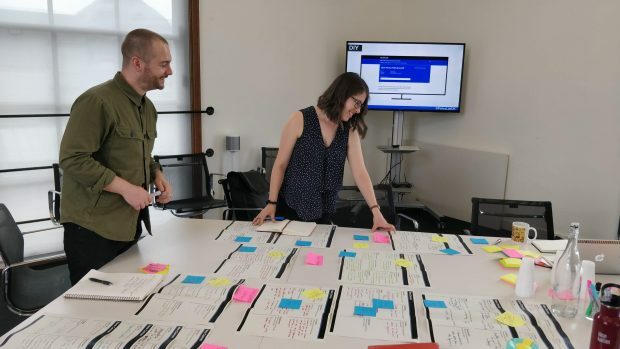 The people that had heard of it are those who have experienced open policy making with the help of Policy Lab or the DWP’s Policy Exploration Team. That’s not to say the Toolkit is not useful. We know it’s used by a variety of policy makers across government and outside. Sometimes Policy Lab receives direct communication from teams that have downloaded useful resources. We also hear from people when the links are broken (this is, paradoxically, a really good source of data!). But the point remains, we could do better to ensure the toolkit is more relevant for the policy makers it is designed for. We can now move forward on our challenge. We know about the system/context that policy teams work in (see Vasant’s last blog). We also know more about the people and their day-to-day experiences. So how can we make it easier for policy makers to practise open policy making? Over the next few weeks you will find us working with policy makers to design and prototyping responses to this challenge. We will be posting a follow up to this on the other side of that work.